venaticus was lifted from these dusty pages and duly registered, and at much the same time became, as Venaticus Collection, the trading name of a small publishing business that was to specialise in high quality reproduction prints of paintings of Clumbers in their Victorian heyday, and later other sporting dogs. to a type the show-orientated owners and breeders of the day – the late 1970s – appeared either to be ignorant of, or to have lost sight of. That type was very different from what the breed had become – and remains now – in the show ring. The very best evidence of what the breed did look like, and what it needs to look like if its original purpose and its functional characteristics – the qualities that will ensure its future – are to be regained, is available in the contemporary illustrations, paintings and photographs. These few examples show a distinctive breed that cannot be confused with any other, but is modest in size, not exaggerated in any way, free from the beetling brows, short muzzle and heavy-lidded eyes typical of later show specimens, and is practical, athletic, lean and alert: in short, what the Venaticus kennel has been striving to achieve for more than 40 years. 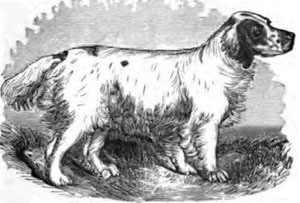 Bruce, circa 1880, as illustrated in Stonehenge’s The Dogs of Great Britain, America, and Other Countries. This engraving of a dog that illustrates a number of books of the time was intended to depict how an ideal specimen should appear. 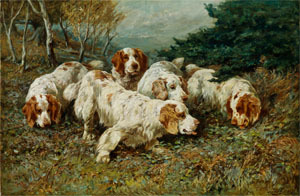 Clumber Spaniels at Clumber Park, a painting of the 1880s by John Emms of the breed’s foundation stock at its ancestral home. Published as a limited edition print by Venaticus Collection and fully sold. The Venaticus kennel remains active today, breeding occasionally, not on a commercial scale, primarily to maintain a bloodline and to fulfil the needs of owner James Darley, and to place surplus puppies with owners committed to working them and capable of exploiting their potential. James has proved to be the breed’s most successful owner in terms of the number of dogs with awards in field trials. The kennel’s influence upon the revival of the breed as a working gundog – “for hunting” – is likely to be seminal. 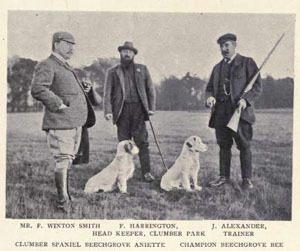 Photograph of 1902 of two working Clumbers, one of them Beechgrove Bee (right) who won numerous field trials from 1899-1902, owned by Mr F. Winton Smith and later Mr J. Alexander, both shown here. These really look the business. 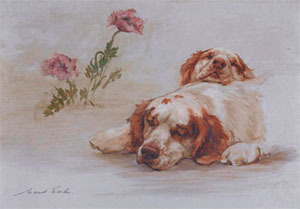 Surely, Surely, Slumber is more Sweet than Toil, an oil painting by Maud Earl of the Duchess of Newcastle’s Clumbers (at Clumber Park), reproduced in 1902 as a sepia tone photographic print in a limited edition folio set titled Gun Dogs. 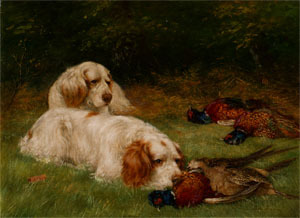 Clumber Spaniels and Pheasants, a painting by a little-known artist, Tom Heywood, dated 1904. Published as a limited edition print by Venaticus Collection and fully sold.